I've been keeping a secret from you guys...I've been quietly testing out a new product (well, new to me at least) in an effort to re-invigorate and renew my curls. It's been helping sooooo much with frizz, smoothness, moisture retention, and shine. So what product is it? You'll just have to check he blog tomorrow! Oh, and if you recognize the bottle, just give me a wink ;-) -- don't ruin the surprise lol! By the way, shoutout to @ecramology @edforward @jordan_spiva @cocoababy1222 @discreet_virgin @rachelsocially and @jdotdoc for winking with me! 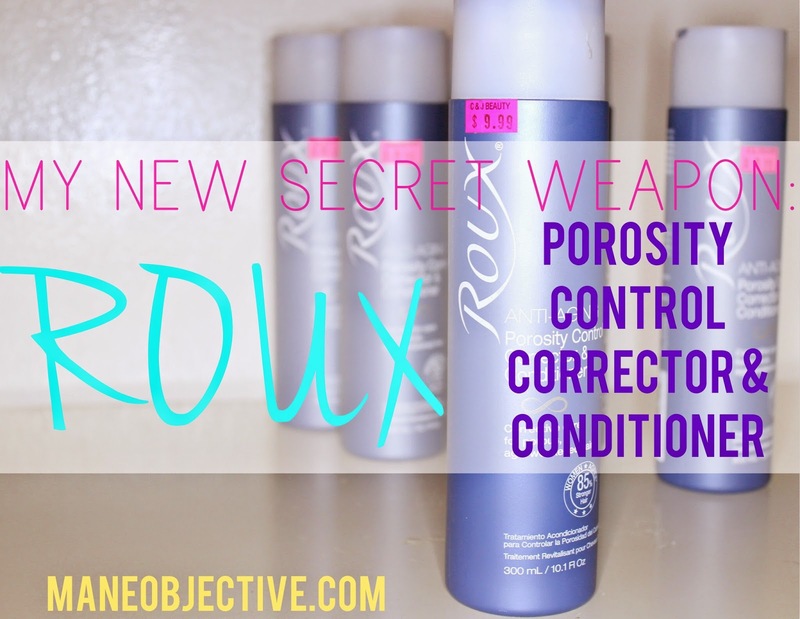 Well now the secret is out: I've been playing in Roux Porosity Control Corrector & Conditioner. I remember first reading about Roux Porosity Control on Princess Linzz's Blog, and it was one of those things I filed away in my PJ memory bank, should I ever need it or encounter porosity issues. Lo and behold nearly a year and a half later, I'm glad I read Lindsey's post (hey boo!). As you guys know, getting real deal hair dye has rocked my lil' curly world. My colored hair behaves differently, looks differently, and interacts with products differently. 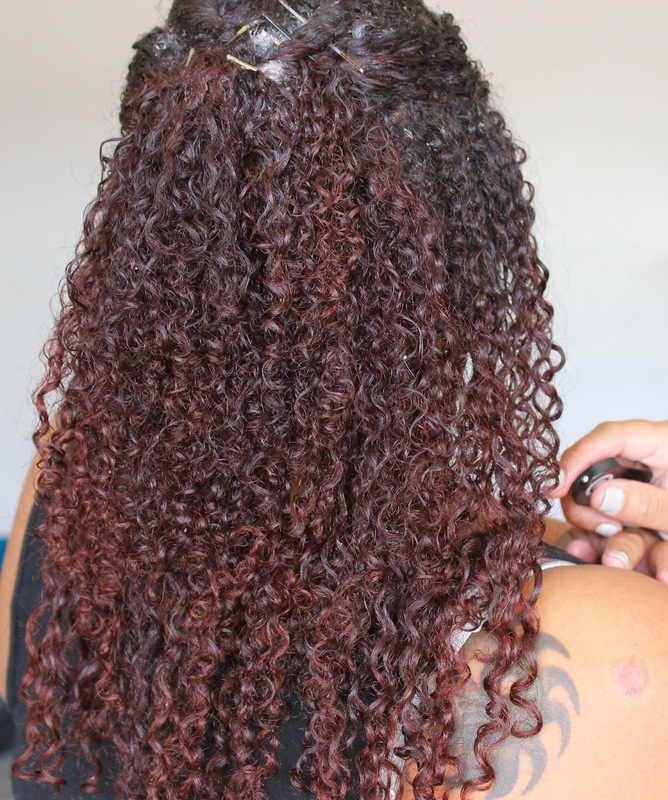 As many bloggers and vloggers can attest to, getting your hair colored changes the porosity of your hair. It's drier, duller, more brittle, and takes a lot of work to maintain. That's where Roux Porosity Control Corrector and Conditioner comes in. 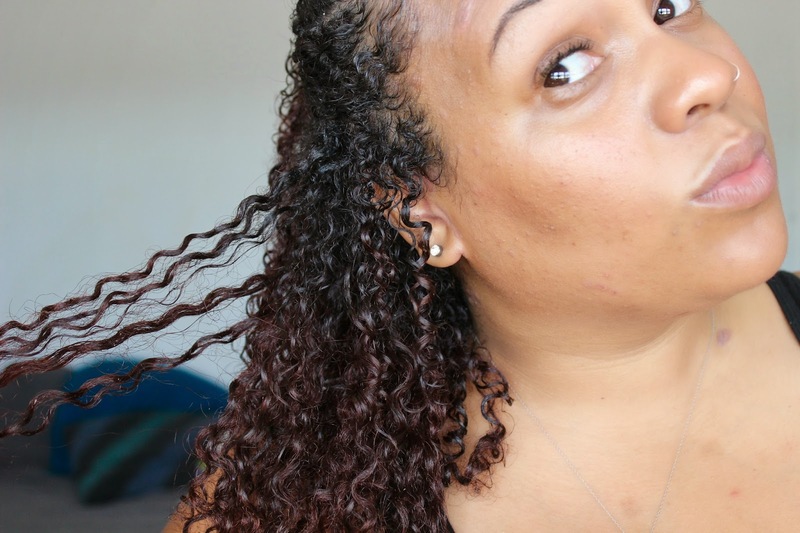 Keep reading for my full breakdown, and how I include it in my wash day regimen! Propylene Glycol: Humectant that improves moisture binding activity which results in silky smooth hair. Oleyl Betaine: Hair conditioning and anti-static agent. Availability: Roux Porosity Control Corrector and Conditioner is sold at Sally Beauty, as well as tons of beauty supply stores nationwide. You can use their nifty online store locator to find a retailer near you. I purchased my Roux Porosity Control Corrector and Conditioner at C&J Beauty Supply on Crenshaw & Imperial. Product Claim/Description: Corrective care for porous, age-weakened hair. Equalize porosity and return hair to a balanced state for increased smoothness and vibrancy. Our scientifically proven formula enriched with keratin and anti-oxidant vitamins closes the cuticle with a pH of 4.5 to rebuild a barrier of protection and achieve predictable results prior to chemical service. Our rejuvenating Instant Vitality Complex works to infuse moisture, add manageability and a luminous shine. Used daily, it repairs porous hair and keeps damaged hair healthier and revitalized for more beautiful, younger-looking hair from the inside out. Performance/Delivery: So. Much. Yes. Roux Porosity Control Corrector & Conditioner is very thin and super slippery in consistency. It's white, pearlesque, and will easily slip through your fingers or run out your hands if you're not careful. Now, before I tell you about everything Roux Porosity Control Corrector & Conditioner is, let me tell you what it is not. It's not a deep conditioner, regular conditioner, leave-in conditioner, or any sort of double-dipping replacement for a product in your regimen. It's a completely new addition, and an extra step (albeit short) in your wash day routine. Should you decide to use it, please know that the extra 30 seconds - 1 minute it adds is totally worth it. We've chatted a few times here on the blog about porosity, so I'll try to keep this straight and to the point. 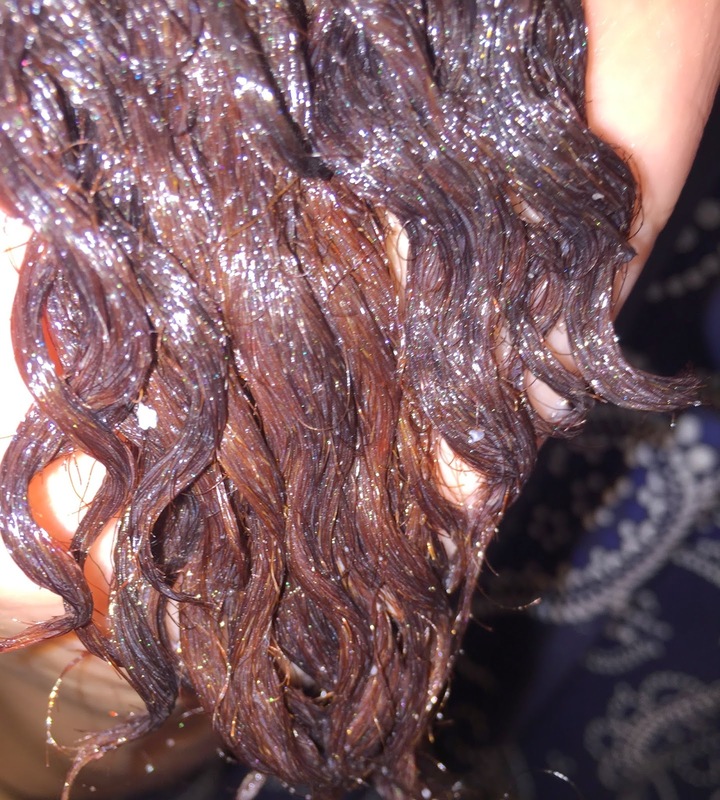 Hair color, heat straightening, and other processes impact the porosity of the hair. Hair that is highly porous loses moisture easily, lacks shine, feels rough, has increased frizz, and is more prone to breakage. Roux Porosity Control Corrector & Conditioner helps correct porosity issues in the hair, and can be used after washing or before a chemical service. I use Roux Porosity Control Corrector & Conditioner (okay, I'm tired of typing that, let's call it PCCC for short) as the final step in my wash day, right before adding my leave-in conditioner. I apply it generously from the ends of my hair on up. I don't finger it through, I smooth it on. It's very slippery, but because of where I use it during wash day, there's no point in me trying to detangle with it. I still use deep conditioners and mud rinses as well. So my wash day goes something like shampoo or co-wash ---> deep condition ---> mud rinse ---> Roux PCCC ---> leave in & style. Not bad, right? It's not a terribly inconvenient step, and it stays on my hair for 1 minute, tops. As a result, my hair is shinier, waaaaaaay less frizzy, smoother, stronger, and less prone to drying out. In other words, my hair behaves more like it did before I started playing around in hair color. For me, that's a huge relief. Don't mind the white stuff -- I had just twisted my hair back shortly before this picture. It goes away. Drawbacks: Not eeeeeven gonna lie on this one. The fragrance is skrong. It's definitely a chemical-esque smell that they tried their darndest to cover with perfume. Very far from natural. Something milder and in the minty family would have worked better for me, but the fragrance most certainly won't keep me away from this gem. Oh, and that's a huge bonus too. It works on the spot. Bottom Line: If you've been fighting with your hair ever since getting a dye job, or have higher porosity hair in general, Roux Porosity Control Corrector and Conditioner is definitely worth a try. Overall Product Rating: 4.5 stars. I can't deny how well it works, but the fragrance just gets me. Best Practices: I highly recommend using it at the end of wash day, to help lay the cuticle flat and prepare the hair for styling. I recommend leaving it on for no more than 2 minutes, and rinsing it out with cool water. For some of you, Roux may be old school. Did you use it back in the day? Newbies, have you tried it out? Leave your thoughts below! Do you recommend this for heat damaged hair? I am natural but I have extreme heat damage. I am transitioning from the heat damage. I pre-poo with oil, detangle with conditioner, shampoo and condition with either TGIN or Trader Joe's Nourish Spa, deep condition. Once my hair dries after applying Giovanni direct leave in, Qhemet Biologics Burdock Cream and Jojoba, it is HARD, MATTED AND TANGLED. You would swear I never washed my hair. It is so dry and tangled knots become forming. All this on wash day. I believe my porosity is high from heat styling. Do you think this will help? I don't know what else to do. It's so frustrating because I end up shedding/breaking from all the tangles. Thanks. I have no color in my hair but I am trying to build moisture/hydration in the hair cortex so my fractal curls can finally flourish. Yes, to this being at sally's, I'll def try and get back to you on the results. Waw! Nice tips for hair. Thanks for sharing. Your hair picture is really nice. You can make an awesome picture by use Color Correction Service. Your sharing elements helpful for hair i have understood after reading your blog . I will use it . Very interesting post.thank you very much. Wow! It's really so interesting.Thanks a lot for sharing you experiment with us. Nice informative post. You have really posted an interesting topic. I like your ideas. 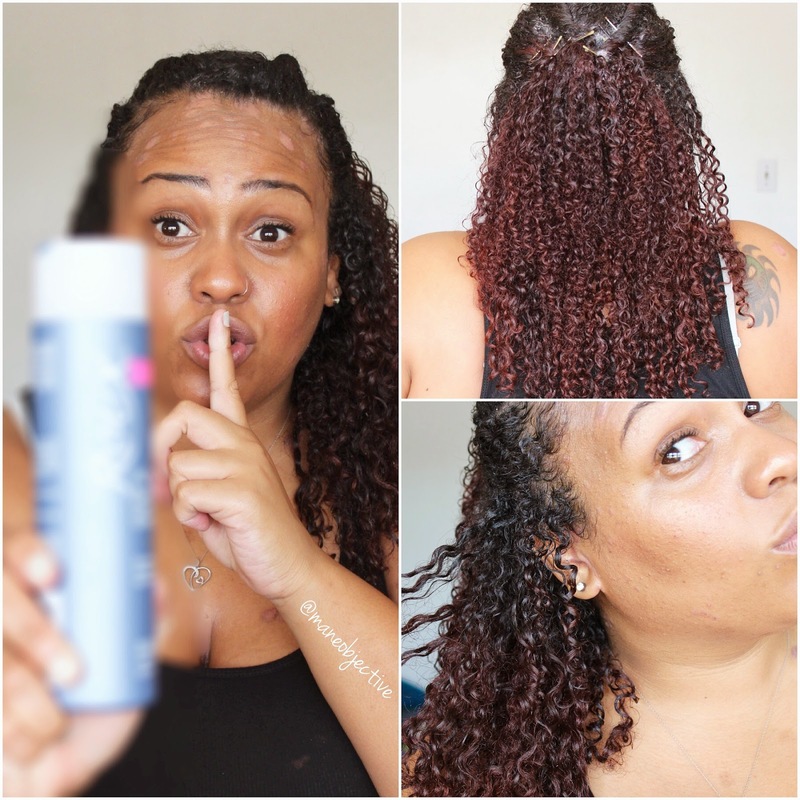 Thank you for your post on Roux Porosity Control Corrector & Conditioner. It's good to know that you used it for a long period of time, as well as how you incorporate it in your wash day routine and that it actually works. Thank you!